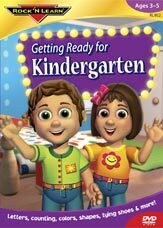 Getting Ready for Kindergarten DVD works well for preschool instruction in daycare or at home. The fun, animated characters Jill and Joey make it easy for your child to get involved and practice right along with the video. Getting Ready for Kindergarten includes plenty of real children to help demonstrate the skills covered. We consulted with leading kindergarten teachers to be certain we covered those skills that would help ensure success in kindergarten. Getting Ready for Kindergarten is also a perfect supplement for kindergarten teachers to use with students who want to learn to speak English. This makes it an ideal video for ESL instruction as well as kindergarten readiness.